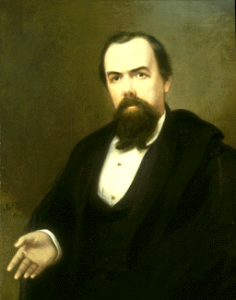 Governor Thomas Andrew Hendricks, Governors’ Portrait Collection, accessed Indiana Historical Bureau. In a storied career that included single terms as senator, governor, and election in 1884 to the vice presidency of the United States, Hendricks spent nearly four decades in public life. First elected to the Indiana House of Representatives in the late 1840s and then to Congress in 1851, he was appointed by President Franklin Pierce (and later reappointed by President James Buchanan) to lead the extremely busy General Land Office during a period of numerous and generous land grants. Increasingly out of step with Buchanan’s proslavery and anti-homestead bill policies, Hendricks resigned his Washington position in 1859. 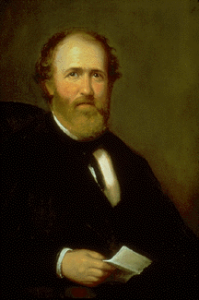 Governor Oliver P. Morton, Governors’ Portraits Collection, accessed Indiana Historical Bureau. He returned to Indiana, and almost immediately found himself at the head of the Democratic Party ticket as it attempted to retain control of the state’s reins of power. However, although 1860 was a Republican year, Hendricks fared better against his gubernatorial opponent, Henry S. Lane, than did the rest of the Democratic ticket. Then, according to a pre-arranged agreement, Governor Lane was chosen by the Republican-controlled General Assembly to become Indiana’s new United States senator. The energetic and ambitious lieutenant governor, Oliver P. Morton, then became governor and served throughout the Civil War. It was a different story in the off-year elections of 1862, when the unpopularity of the war and many of President Abraham Lincoln’s policies—especially his emancipation plan—resulted in a Democratic sweep of state offices, including control of the Indiana General Assembly. When this body elected another new senator, the popular Hendricks was chosen. 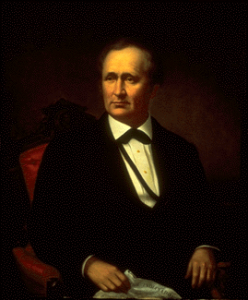 In office from 1863 to 1869, Senator Hendricks was involved with the final years of the Civil War and the first years of Reconstruction. Initially, he stoutly supported the Union’s war effort, but not the plans for the emancipation of African American slaves. After the war, he spoke out against (and voted against) the three so-called Civil War Amendments (the 13th, 14th and 15th) to the federal Constitution. In his view, the impassioned feelings of the immediate postwar era and the absence of representatives in Congress from eleven states, made the times “unpropitious” for making basic constitutional changes. Governor Conrad Baker, Governors’ Portraits Collection, accessed Indiana Historical Bureau. Obviously, Hendricks’s views resonated with his fellow Hoosier Democrats, and while still a senator he was nominated to run again for governor in 1868. Hendricks was narrowly defeated by the incumbent governor, Conrad Baker, who had succeeded Morton when he went to the U. S. Senate in 1867. Hendricks retained his personal popularity and ran a third time, successfully, for the governor’s seat in 1872, serving from 1873 to 1877. Still not done with electoral politics, the charismatic governor was Samuel J. Tilden’s running mate in the famous “disputed election of 1876,” in which the Democratic team received more votes than did their opponents, but a partisan Electoral Commission awarded the victory to Republicans Rutherford B. Hayes and William A. Wheeler. 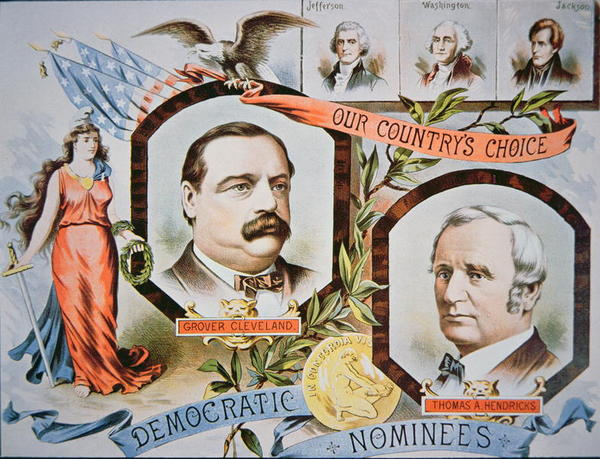 Campaign poster for Grover Cleveland and Thomas A. Hendricks, 1884, courtesy of PBS Learning Media. Hendricks’ final campaign came in 1884 when he reluctantly, for health reasons, agreed to join Grover Cleveland at the head of the Democratic Party ticket. Successful this time, Hendricks’ service as vice president was destined to be short. Inaugurated in March 1885, the Hoosier politician died at his home in Indianapolis in November 1885. Regarding Hendricks’ Civil War years in Indiana, there is no evidence that he was a member of any “dark lantern” society, the Knights of the Golden Circle, the Sons of Liberty, or the Order of American Knights; nor was he a Copperhead, if one defines that term as a Northerner who supported the South during the war. If, however, one defines the term more broadly to include those who opposed the Lincoln administration and, following Lincoln’s death, the Radical Republican agenda, then, of course, Hendricks certainly belongs in that category. Greenback bill, issued March 1863, courtesy of Museum of American Finance. He was an outspoken critic of what he considered the excesses of Lincoln’s wartime policies, including emancipation, suspension of the writ of habeas corpus, high tariffs, the issuance of “greenbacks” and other banking policies that he believed aided the New England states at the expense of western states, and many more extra-military actions by both the state and national administrations. In particular, Hendricks lambasted the Lincoln administration in a major speech in Indianapolis on January 8, 1862, during the state Democratic Party convention, which in its platform condemned the Republicans for rejecting compromises that might have averted war, and for its violations of freedom of the press and the domestic institutions of sovereign states. But Hendricks consistently supported the war to save the Union, urged compliance with the draft, and deplored armed resistance to its enforcement. Thomas A. Hendricks monument at the Indiana State House, accessed Wikipedia.org. In May 1863, at the time of another party gathering in Indianapolis, Hendricks was threatened by an unauthorized band of roaming soldiers when he attempted to speak. The melee that followed led up to the events known as the “Battle of Pogue’s Run.” Hendricks was also at the center of a volatile situation when he joined Governor Morton on the steps of the state house in eulogizing the assassinated president; Morton’s stern demeanor quieted the protesters, following cries of “Hang him” aimed at Hendricks, and the Democrat was able to continue his remarks. 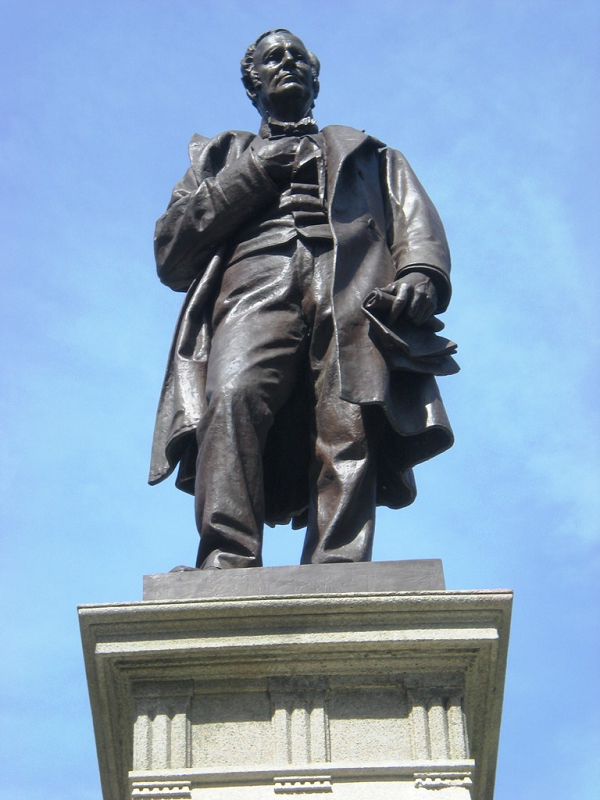 Ironically, this episode occurred near the site on the current State House grounds where a tall monument with a larger than life-size statue of Hendricks was erected in 1890 and still stands. Gray, Ralph D. “Thomas A. Hendricks: Spokesman for the Democracy,” in Gray, ed., Gentlemen from Indiana: National Party Candidates, 1836-1940. Indianapolis: Indiana Historical Bureau, 1977. Holcombe, John W., and Hubert M. Skinner. Life and Public Services of Thomas A. Hendricks with Selected Speeches and Writings. Indianapolis: Carlon and Hollenbeck, 1886. Neely, Jr., Mark E., The Fate of Liberty: Abraham Lincoln and Civil Liberties. New York: Oxford University Press, 1991. Stampp, Kenneth M. Indiana Politics during the Civil War. Indianapolis: Indiana Historical Bureau, 1949. Tredway, G. R. Democratic Opposition to the Lincoln Administration in Indiana. Indianapolis: Indiana Historical Bureau, 1973.